This seminar recording is guaranteed to increase your skills and raise your confidence as you encounter high risk clients and situations. 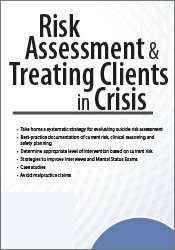 You will walk away with the tools needed to meet the current professional and legal standards of care to accurately assess and treat clients in crisis. Multi-disc DVD recording (5 hours, 58 minutes) with electronic manual and instructions. Discover the single most important principle of risk assessment. Implement best practices regarding documentation of risk assessment. Develop strategies for performing interview and mental status exams in adversarial situations. Provide distinct approaches for managing acute risk versus chronic risk. Discuss guidelines for determining appropriate level of intervention based on current risk. Identify appropriate steps to avoid malpractice claims. David D. Nowell, Ph.D., is a clinical neuropsychologist in private practice in Northborough, Massachusetts. He offers consultations to patients on an inpatient rehabilitation unit and is an adjunct instructor in neuropsychology to graduate students in the Clark University psychology program. He serves as a physician advisor with the University of Massachusetts Medical School Disability Evaluation Service where he was the former clinical director of the Learning Disability Assessment Program. Dr. Nowell writes a popular blog at Psychology Today on motivation and time management, and speaks internationally to clinicians on such topics as executive functioning, non-medication management of ADHD, and applying findings from Positive Psychology. Financial: David Nowell maintains a private practice. He receives a speaking honorarium from PESI, Inc. Non-financial: David Nowell has no relevant non-financial relationship to disclose.